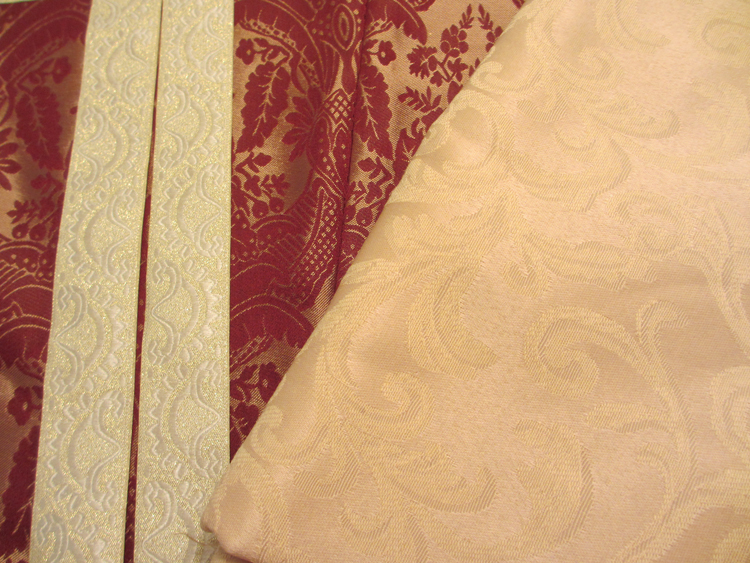 Although I just received my Truly Victorian Alexandra Bodice and Imperial Skirt patterns in the mail, I decided to spend my sewing weekend starting a gown that I’ve had the fabric for for a few years now, but didn’t feel prepared to start until recently. I’ve always been inspired by gowns like this one by The Couture Courtesan. Since there isn’t a pattern for this exact silhouette and bodice shape in The Tudor Tailor, after doing some research I bought the Simplicity 8881 pattern pictured below. 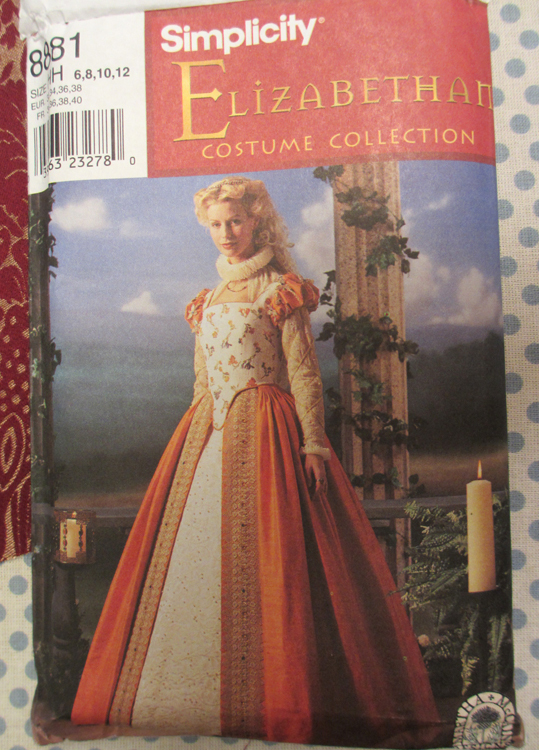 The pattern is based on a gown that Gwyneth Paltrow wore in Shakespeare in Love, and I saw it recommended on a couple Renaissance costuming pages for it being pretty accurate as far as commercial patterns go. It’s discontinued now, but I was able to grab a copy off eBay for around $10. I plan on doing something different with the sleeves, though. Last night I cut out the pattern and made a mock up of the bodice to check the fit. It allows for 2 inches of ease, and I’m not happy with it being that loose, so I’m making one size down from what it recommends for my measurements and I’ve had to tighten the seam allowances up a bit, too. I also had to drop the neckline and make the bust less curvy to give the bodice the right shape and fit. I wasn’t happy with how high the neckline came on my chest. After at least eight hours of work today, I got the bodice lining together, the boning channels in, and the boning inserted. I had to skip putting boning into a couple of the channels because the pattern recommended buying eight yards (which I did) but I ended up running short. I think it’s because the pattern specifies 3/8 inch wide boning, but all I could find at the store was 1/4 inch wide boning. So if you use this pattern, get at least one more yard of boning if you have to use 1/4 wide stuff. I’m not worried about it affecting the structural integrity of my bodice because I am planning on wearing my corset under this. 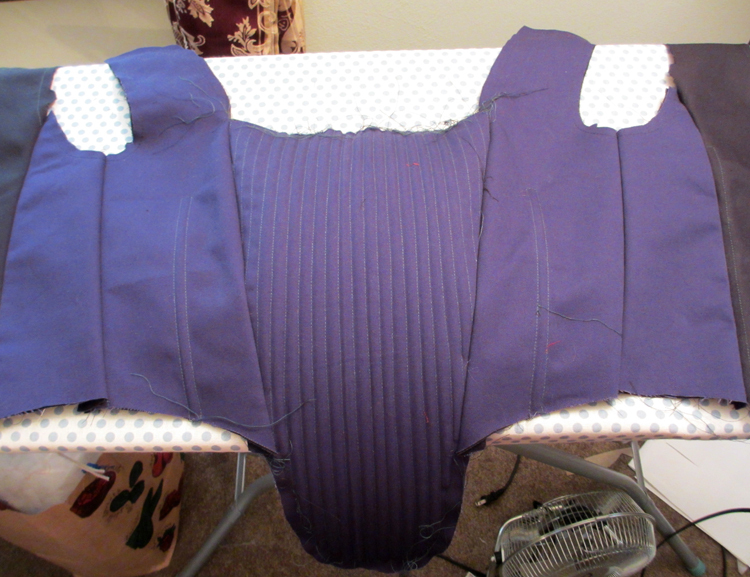 With all that boning, and these two layers of cotton twill lining the gown, it’ll be like wearing armor. At the end of the day I started sewing together the shell pieces before my eyes started crossing and I had to call it quits. The next step will be carefully basting the shell to the lining, making sure that everything stays flat and straight. I’ve got the boned lining under a stack of books for the night to try to un-curve the boning a bit. I still need to figure out if I want the bodice to be tabbed at the bottom, and what shape the tabs should be if I do, and if I want the piping around the bottom front to be contrast or the same fabric as the shell. I’m sort of just winging it on the details because I’m not sure how any of my ideas will look until I start working on them. I will keep updating on the progress of this one! 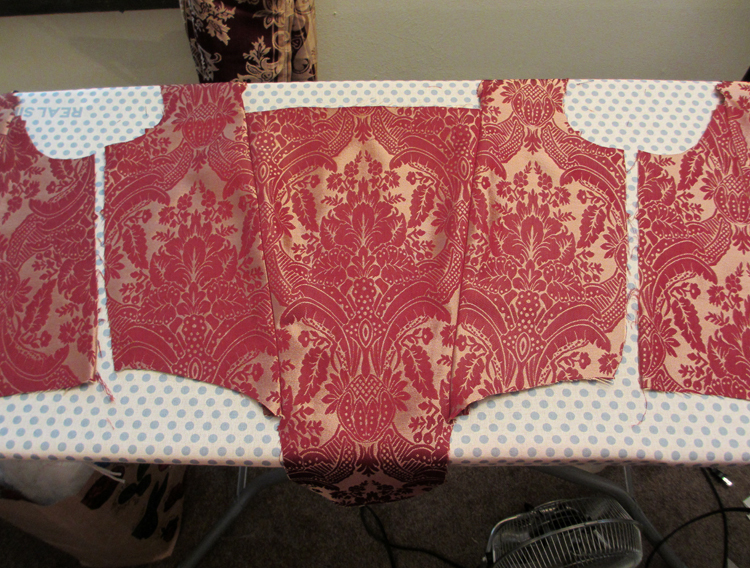 I should probably also do a post about how I made my Elizabethan corset, too.